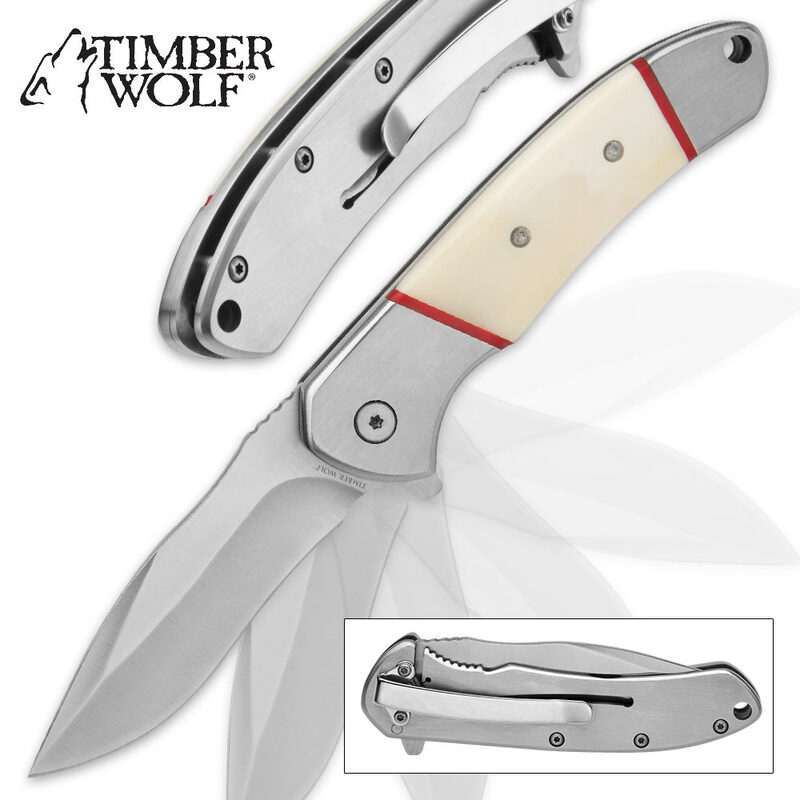 Timber Wolf Cloudscape Assisted Opening Pocket Knife | BUDK.com - Knives & Swords At The Lowest Prices! One of the best values on the knife market today, Timber Wolf's Cloudscape Pocket Knife boasts a stout feel, solid construction, classic form and smooth, near-instant blade deployment that's unmatched by knives at two and even three times its price! 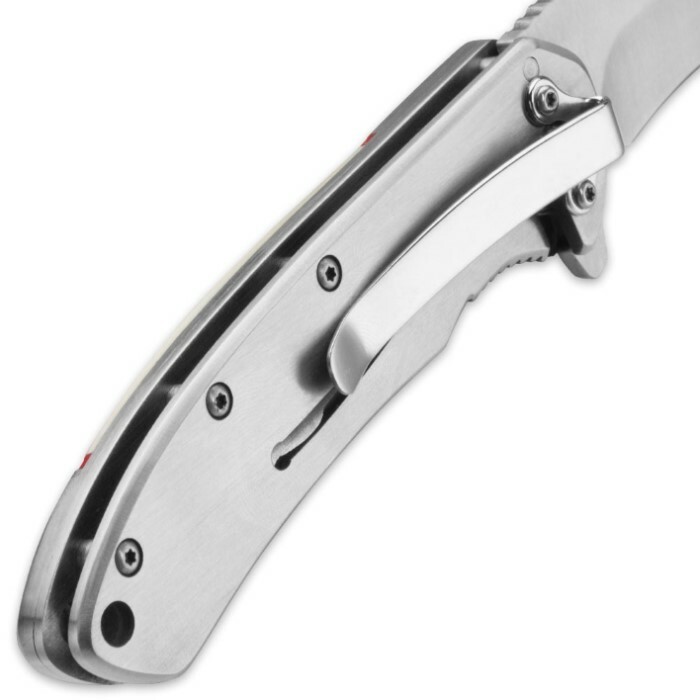 Its tough 3 1/8" drop point blade is forged from resilient 3Cr13 stainless steel and features sleek lines and a fine edge that's razor sharp right out of the box. Just nudge the handy flipper, and the stately blade opens in the blink of an eye, thanks to the velvety smooth assisted opening mechanism. The Cloudscape makes quick work of even the most demanding cutting tasks, and the sturdy liner lock keeps the blade fixed safely in the open position while performing vigorous work. More than just a utilitarian workhorse, the Cloudscape boasts ample beauty to accompany its undeniable brawn. 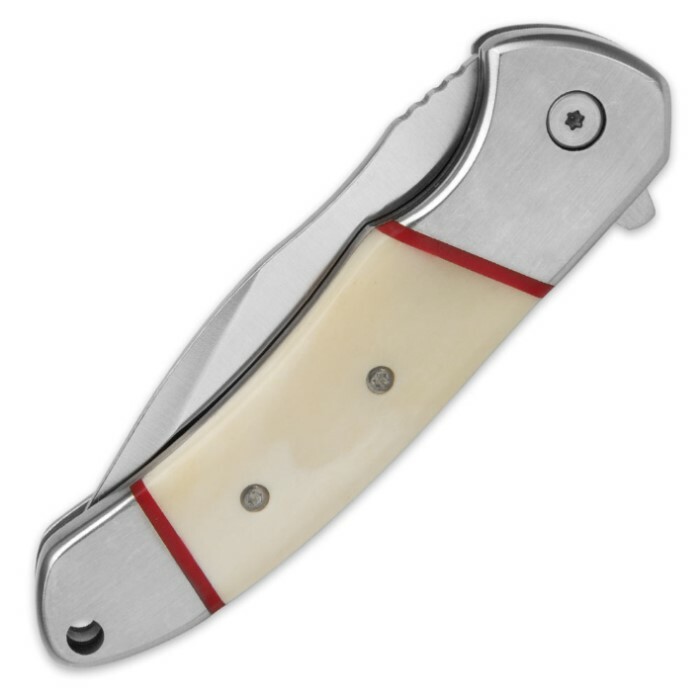 Handle scales of genuine bone - with its natural grain and shades of cream, ivory and porcelain - gracefully offset the tastefully simple stainless steel bolsters. Delicately sanded and polished, the handle affords an outstanding hand-feel; add the Cloudscape's impeccable balance and superb weight, and the result is a knife wielding experience that's second to none. At 4 3/8" closed, the Cloudscape is versatile and well suited to a range of tasks. Its moderate size also makes it easy to carry everyday, especially with the added convenience of the integrated pocket clip and lanyard hole. Timber Wolf's Cloudscape Assisted Opening Pocket Knife is a remarkable all-around folder, and best of all, it's surprisingly affordable! At this price, you can add the Cloudscape's sister folders - the "Forestscape" and "Riverscape" (both sold separately) - without breaking the bank! Show them off in a collection, carry all three or keep one and gift two! You simply can't go wrong with Timber Wolf knives! Good solid knife for a low price. This one came sharp out of the box and needed no encouragement. Blade is a little stiff to open but that is easy to fix. I am a fan of the heft of the handle, the thick blade lock and the smoothed bone. Fit and finish above its price point. Got this knife a few days ago here on a whim, despite being only a six dollar knife it manages to impress. Instead of offering my opinion I'll sort its qualities instead and let you make up your mind. Pros: -The bone scale is nicely polished and smooth -The blade and frame has a nice and even matte finish -Frame lock holds sturdy and is easy to use -Pocket clip has a strong enough hold Cons: -The assisted opening works well but is rather stiff to get started -Uses 3Cr13 steel, not an awful steel and honestly the best you will probably get at this price point ($6) but still felt it needed mentioning, decent enough for most purposes although it will need frequent sharpening and don't expect it to hold a razor edge for long at all. -The red plastic spacers are not a perfect fit for the bone scale, mine came slightly too thin with small but noticeable indent on the forward spacer where it didn't align with the frame towards the grip, the former is acceptable for the margins they make these things on the later I would classify as a defect in the manufacturing specifications. Other: -Uses nylon/plastic washers, these will eventually wear out after a while and limit the types of lubrication you can use to help loosen the rather tight assisted open. That said it's pretty much unheard of to find metals ones on any knife under $30 so I can't hold it against a $6 dollar knife. -The blade comes rather dull, being such a soft steel you would have to sharpen it again soon anyway so look towards doing that first thing once you get it. Final thoughts. Honestly for six dollars you could do a lot worse, from my experience this is probably the best folding knife that six dollars is going to get you, I'd even argue that this knife has a similar level of build quality that you don't start to see until you get into the thirty and forty dollar range of knives. I'm honestly impressed that whoever they contracted this out managed to make something this well manufactured and fitted at a five dollar price point. While i wouldn't really recommend this as a EDC for most people do to the frequent sharpening it would require it very well could serve as such in a pinch, it would also make a decent stocking stuffer or even a spare knife to serve as a cheap loaner to others you wouldn't trust with your main blade. Final Rating 5/5 Stars, It's not the greatest knife in the world but it's leagues above its competition for the price point.